By ticking the box, you agree to the following terms and conditions. This Terms and conditions applies for FC Miami City (FC Miami City) and all the domain name associated. FC Miami City LLC, US Champions Soccer Academy LLC (also called “FC Miami City” or “we” in the following Terms and Conditions document) provides soccer related training, events and entertainment. 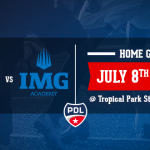 The PDL (also called “Premier Development League”) is the league where the FC Miami City evolves. The Tryouts are the event where the players are selected in order to compete in the PDL championship. Registration is based on availability and will be effective only upon (i) complete payment reception and clearance and (ii) registration confirmation. A complete and cleared payment of the tryouts fee per Participant, depending on the program chosen, except when otherwise noted, and a completed registration form (“Reservation Form”) are required to reserve a space for the FC Miami City tryouts. If the Participant has a chronic medical condition such as diabetes, seizure disorder, severe allergies or mental health disorder there might be special requirements that are applicable for the Participant to attend the tryouts or the PDL season. Please refrain from registering online and send us an email at [email protected] to register. The Participant, and the Parent(s) or Guardian(s), if the Participant is a minor child, certify that he or she must inform FC Miami City’s office of any existing physical or mental illness, disability, pregnancy, or disability that would create a hazard for himself or herself or any other condition for which he or she may require medical attention or special accommodation during the FC Miami City PDL season. FC Miami City makes no guarantee to be able to accommodate the Participant for such condition(s), and makes no representations or warranties regarding special accommodations or handicap accessibility on the FC Miami City Soccer activities. In consideration of participation in the PDL season and use of the facilities provided by the FC Miami City, the Participant, and the Parent(s) or Guardian(s), if the Participant is a minor child, do hereby knowingly, freely, and voluntarily assume all risk and liability for any damage or injury to person or property that may occur as a result of the Participant attendance in activities or use of any facilities provided by FC Miami City, and do hereby release, discharge, and covenant not to sue FC Miami City LLC., its members, managers, employees and representatives, attorneys, servants, agents, and volunteers for any reason, including any of the released parties’ negligence. The Participant, and the Parent(s) or Guardian(s), if the Participant is a minor child, hereby acknowledge that playing or practicing or training in soccer is a potentially hazardous activity; agree that he or she is voluntarily entering and assuming all risks associated with participating in those activities, including but not limited to falls, contacts with other Participants, the effects of weather including heat, humidity, rain and the conditions of the training grounds, fields and facilities, all risks being understood and appreciated by you. Having read this waiver, and knowing these facts, the Participant, and the Parent(s) or Guardian(s), if the Participant is a minor child, hereby waive and release FC Miami City LLC., members, managers, employees and representatives, attorneys, servants, agents, and volunteers from all claims and liabilities of any kind arising from the participation in the FC Miami City soccer activities. By completing the registration procedure the Participant, and the Parent(s) or Guardian(s), if the Participant is a minor child, warrant and represent that the Participant have consulted a physician regarding participation in physical activity, and represent and warrant that the Participant is physically capable and mentally able to participate in the physical activity. Participant shall not carry or possess a firearm, knife, weapon, or an item which can be used as a weapon. Notice is hereby given that possession of a firearm, a knife, a weapon, or an item, which can be used as a weapon, is grounds for expulsion from the remaining of the tryouts or the PDL season. Parent(s) or Guardian(s) will be immediately notified to pick up the Participant. The fee paid for the tryouts will not be reimbursed. Notice is hereby given that possession or sale of controlled substances, as defined in Florida statutes, Chapter 893, by any Participant is grounds for expulsion of the tryouts. Student possession of or being under the influence of alcoholic beverages, and/or hallucinogenic drugs or combinations of drugs or substances having hallucinatory effects, marijuana, or under the influence of glue or other drugs or combinations of drugs or drug paraphernalia expressly prohibited by federal, state, or local laws, including prohibited substances which shall include those substances possessed, sold, and/or used that are held out to be, or represented to be, controlled substances, illegal substances, or counterfeit in any respect illegal or controlled substances is grounds for expulsion from the remaining of the program and referral to proper law enforcement agencies. Further notice is hereby given that possession of prescription drugs, or any other over-the counter medication, not specifically ordered for the Participant by a physician or the Participant’s parent or guardian is ground for expulsion from the remaining of the tryouts or the PDL season. Parent(s) or Guardian(s) will be immediately notified to pick up the Participant. The fee paid for the tryouts will not be reimbursed. FC Miami City may cancel or suspend its soccer activities or Events at any time for any reason. 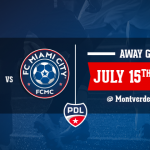 FC Miami City will make commercially reasonable efforts to keep the schedule as it has been published; however, the final schedule may vary due to factors beyond our control. We may in our sole discretion substitute services or goods of similar quality for any service or goods stated in the schedule. Exceptional cancellation due to adverse weather conditions, acts of God, strikes, is not considered as a cancellation by FC Miami City. Should the FC Miami City’s season be cancelled (for an entire session), FC Miami City’s liability is limited to a full refund of the tryouts fee paid by each Participant for the corresponding session; FC Miami City will not be liable for any other costs, damages, or refunds of any kind for any loss, delay, inconvenience, disappointment, or expense whatsoever triggered directly or indirectly by a tryouts cancellation. By completing the registration procedure the Participant, and the Parent(s) or Guardian(s), if the Participant is a minor child, warrant and represent that no request will be put forward in excess of the tryouts fees. If for reasons beyond our control, a FC Miami City Soccer event in progress must be interrupted or cancelled, we will in good faith consider refunding a portion of the FC Miami City tryouts fee depending on our actual costs incurred. The Participant, and the Parent(s) or Guardian(s), if the Participant is a minor child, grant authorization to the FC Miami City to use photographs of the Participant for publicity purposes. The Participant, and the Parent(s) or Guardian(s), if the Participant is a minor child, acknowledge and agree to assume and be fully responsible for any and all property or other damage to facilities provided during the FC Miami City soccer activities. FC Miami City is not responsible for lost or stolen article, valuable or money. The Participant, and the Parent(s) or Guardian(s), if the Participant is a minor child, are advised not to bring valuable items at the FC Miami City soccer activities. The credit card number on file will be charged for any unpaid balances, damages, extension fees and/or expenses incurred during the stay. All prices are in U.S. Dollars (U$D) or in Euros (€). Prices are subject to change without notice. No reimbursements can be requested in case of price change for executed and cleared transactions. All fees are non-refundable even in the event of Participant’s absence to event/training/tryouts sessions. Cancellations must be made by certified letter to FC Miami City’s Office (1101 Brickell Avenue, South tower, Suite 8000. Miami, FL, 33131). A $100.00 (or 100.00 €) cancellation fee will be assessed for any cancellation received over 30 days prior to the event/training/tryouts start date. There will be no refund for any cancellation made less than 30 days prior to the event/training/tryouts start date. A $100.00 (or 100.00 €) change fee will be assessed for week reservation changes. FC Miami City will make reasonable effort to accommodate the change which will be subject to space availability. The tryouts fee for the changed week will be charged full price; therefore the fee difference, if any, will be assessed in connection with the change confirmation. If a dispute arises under this agreement that cannot first be resolved through good faith negotiation, the dispute will be submitted to arbitration and resolved by a single arbitrator (who will be a lawyer) in accordance with the Commercial Arbitration Rules of the American Arbitration Association then in effect as modified by this paragraph. All such arbitration will be confidential and take place at the office of the American Arbitration Association located nearest to Miami, Florida. The award or decision rendered by the arbitrator will be final, binding and conclusive and judgment may be entered upon such award by any court. The arbitrator has no authority to award attorneys’ fees. If a conflict arises between this document and any other document binding both parties on the same matter, the provisions of this document shall apply. FC Miami City conducts tryouts throughout the year. The preparation period and league season spans from March to July. For “out of state players” (players who do not reside in Florida), FC Miami City discretionary cover some expenses, such as: plane tickets, food and accommodation. 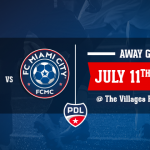 FC Miami City will help the foreign player to obtain a legal tourist visa to come play for the club; FC Miami City cannot, however, be held responsible if the visa is refused or cancelled. FC Miami City is an amateur club and a non-professional organization. FC Miami City can’t offer any kind of salary, stipend or form of payment to its players, in accordance with USL PDL league’s regulation. This Terms and conditions applies for FC Miami City (FC Miami City) and all the domain name associated.